The Ambassador Hotel stood at 3400 Wilshire Boulevard, between Catalina Street and Mariposa Avenue, Los Angeles, from 1921 until it was demolished in 2005. The famed Cocoanut Grove Nightclub was the place to rub elbows with the biggest names in Hollywood for more than four decades. After the assassination of Robert Kennedy in 1968 and the decline of the neighborhood, the Ambassador's fate was sealed. 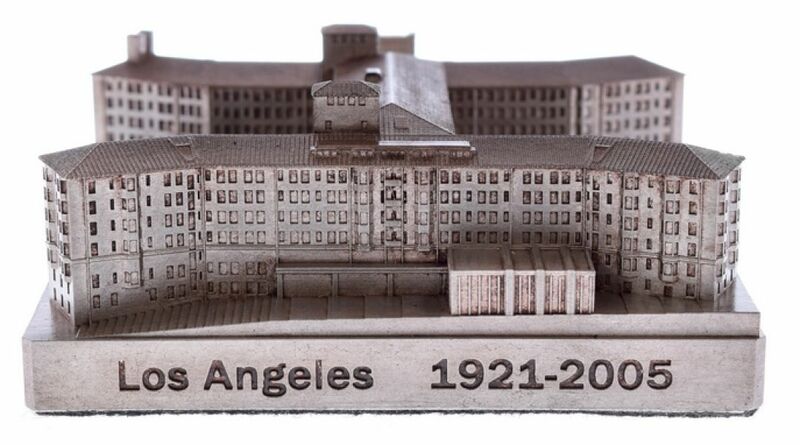 Even the valiant efforts of the Los Angeles Conservancy and Art Deco Society could not save the once treasured gem. 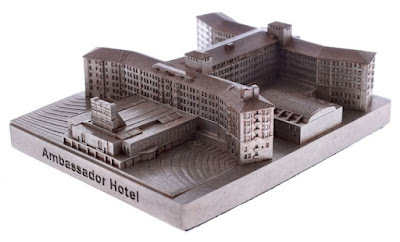 Now, thanks to InFocusTech, you can have a replica (shown above and below) of this important historical building. This lost icon of LA is available from InFocusTech here. 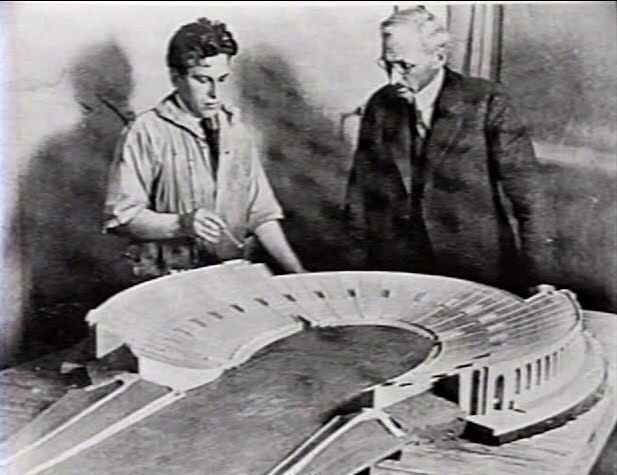 The architect was Myron Hunt, shown on the right, above. Hunt is mentioned in the writings of Frank Lloyd Wright and other Chicago architects of the era as an early member of the group which came to be known as the Prairie School, but in 1903 he moved to Los Angeles. He was involved in designing the Rose Bowl and the Mount Wilson Observatory, as well as other southern California projects. Hunt fashioned the Ambassador Hotel in an eclectic Mediterranean Revival style with Art Deco elements and signage. 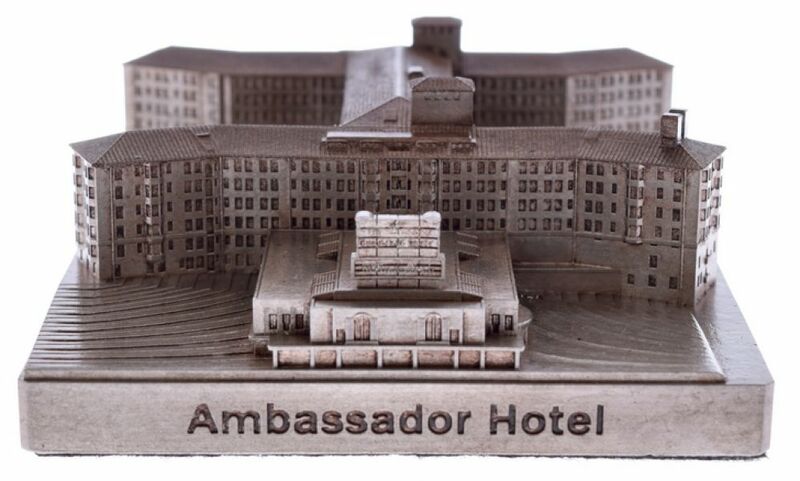 The date the Ambassador Hotel was completed, 1921; the date it was demolished, 2005. The InFocusTech replica's dimensions are 3-7/8" x 4-3/4" x 1-9/16". Order here. InFocusTech's replicas are of the highest quality and sought after collectibles. During the 1920s, the Ambassador Hotel's nightclub Cocoanut (it is not spelled "Coconut") Grove was frequented by celebrities like Louis B. Mayer, Charlie Chaplin, Douglas Fairbanks and Mary Pickford, Howard Hughes, Clara Bow, Rudolph Valentino, Gloria Swanson, Anna May Wong, Norma Talmadge and others. According to Photoplay, Joan Crawford and Carole Lombard were frequent competitors in the Charleston contests held on Friday nights; Lombard was discovered at the Grove. In the pantry area of the Ambassador Hotel's main kitchen, soon after midnight on June 5, 1968, and after a brief victory speech in the Embassy Room ballroom of the Ambassador Hotel, the winner of the California Democratic presidential primary election, Senator Robert F. Kennedy (RFK), was shot along with five other people. The date was significant, for it was the first anniversary of the first day of the Six-Day War between Israel and its Arab neighbors that began on June 5, 1967. 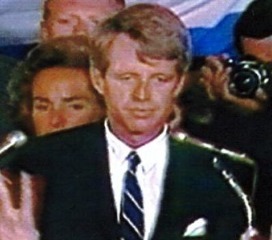 RFK was shot on the first anniversary of this war, and died on June 6, 1968. Palestinian immigrant Sirhan Bishara Sirhan - who was not a "Palestinian immigrant," but a Jordanian Christian Arab - was arrested at the scene and later convicted of the murder. Kennedy died one day later from his injuries, while the other victims survived their wounds. During the demolition of the Ambassador Hotel, in late 2005 and early 2006, portions of the area where the 1968 shooting occurred were eliminated from the site. The portion of Wilshire Boulevard in front of the hotel has been signed the "Robert F. Kennedy Parkway." The greatest loss to Hollywood will forever be the demolition of The Ambassador Hotel/Coconut Grove. It stood for 84 years. And in our life time it was lost. The number of good memories and amazing positive things that happened there far out weight the bad. There was only ever one in the entire world. It is literally irreplaceable. We had it and we didn't appreciate it enough to save it.